Awards Season is officially here! The Golden Globes starting in a few hours just down the road from us at the Beverly Hilton. 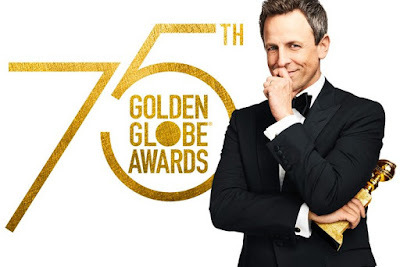 One of our favorite late night hosts, Seth Meyers, is taking the reigns as host tonight, and we can't wait to see what he has planned! While this year's awards have some incredible nominees, I still can't get over the snubs for "The Big Sick" and Jordan Peele for "Get Out". Hopefully the Oscar nominations will right these wrongs in a few weeks here. As tradition holds, it's time for me to make my annual picks for the Golden Globe winners. I always feel like the Golden Globes are the hardest to pick. The Hollywood Foreign Press always seems to have far different taste than most of us making picks. While "The Shape Of Water" has 7 nominations, I really don't see it winning anything. I really do not understand the hype of the film. Without further aideu, here are my picks for this year's awards. The only film I really see possinbly taking a win in this category other than "Call Me By Your Name" is "Three Billboards", but I think "Call Me By Your Name" will speak on a higher level to the HFPA. How great would it be to see "The Disaster Artist" somehow take a win here? "Lady Bird" is easily the best film, but the history of "The Disaster Artist" would just make it awesome. How the hell did "Boss Baby" really get a nomination? To put "Boss Baby" at the same caliber of film as "Coco" is just laughable. "Dunkirk" was a directing masterpiece. I know a lot of people think that Guillermo will take this for "The Shape Of Water", but I don't think there was anything special about the Directing of the film. It was simplistic and nothing compared to the overall scope of Guillermo's work. The only other possibly I forsee is Martin McDonagh for "Three Billboards", but this should have been a nomination for "The Big Sick". This break out role for Timothee Chalamet will be a defning one in his career. While the others gave great performances, Timothee also had a great performance in "Lady Bird" that is going to sway voters as well. Let's hope James accepts the award in character as Tommy. I know a lot of people may be suprised by this pick, but don't forget that Plumber did this entire film in 9 days and still managed to get a Golden Globe nomination! Don't count out Sam Rockwell for "Three Billboards" or Willem Dafoe for "The Florida Project", but I think Plumber will suprise everybody. Laurie Metcalf could easily come in and win this as well for her role in "Lady Bird", but I think we see Allison Janney take this one home. After their win at The Emmy's, I don't see how they don't take this one home. I really wouldn't be suprised to see Frankie Shaw take this home for "Smilf"